So by now we all know about my love of home wear, so when Homesense asked me to take part in their secret sharers campaign I couldn’t say no. I jumped in the car, grabbed my friend Alix and we drove out to one of the biggest stores in the south to find the perfect pieces for my new house. The store was huge, and I found SO many beautiful things (you can see them all together in this haul here), it also had a TK Maxx joined on to the store as it’s part of the TK Maxx (or TJ Maxx if you’re US based) family. It’s great for everyday essentials but also really unique pieces and the stock changes super frequently, so there are always new and amazing pieces to find – you can also buy everything for up to 60% off their original retail price – did you need more reasons to visit? After scouting out every inch of the store (and making two trips to the till), I had a tonne of amazing new pieces for both our bedroom and living area. 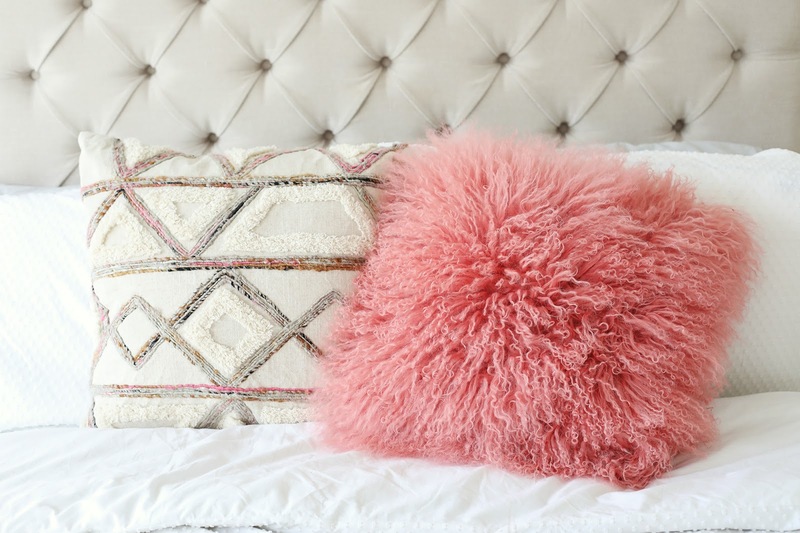 Today I’ll be running through the new additions to the bedroom and how I styled them! The bedroom is one of my favourite rooms in the house, and is an absolute joy to work on. Though it was almost 99% done before our trip, I actually found the perfect large piece of furniture to add to the room – totally unintentional as I’d planned on leaving the space bare but the gorgeous grey herringbone armchair was too perfect to leave behind. It just about fit in the car but fitted in to our little nook by the shutters perfectly. It also cost me £159.99 which for this style of chair is such a saving I couldn’t believe it! 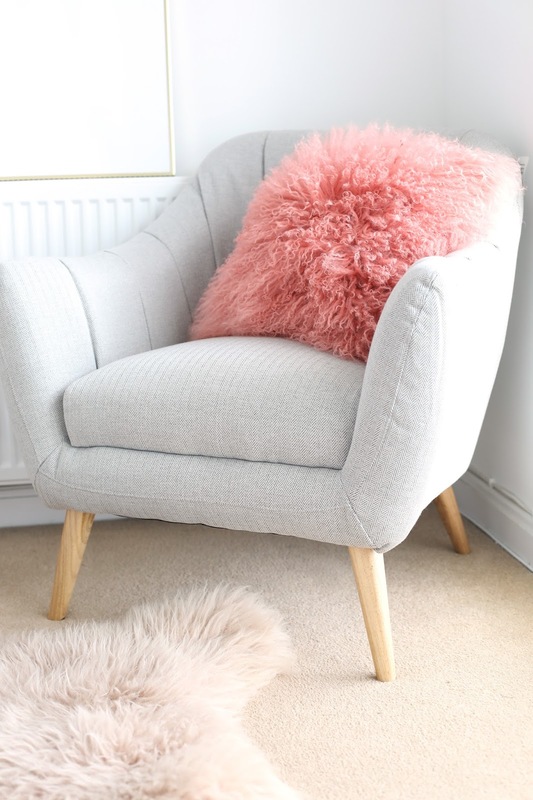 I added our coral fur pillows (a previous Homesense purchase from a few weeks back, costing £34) to add a little pop of colour. 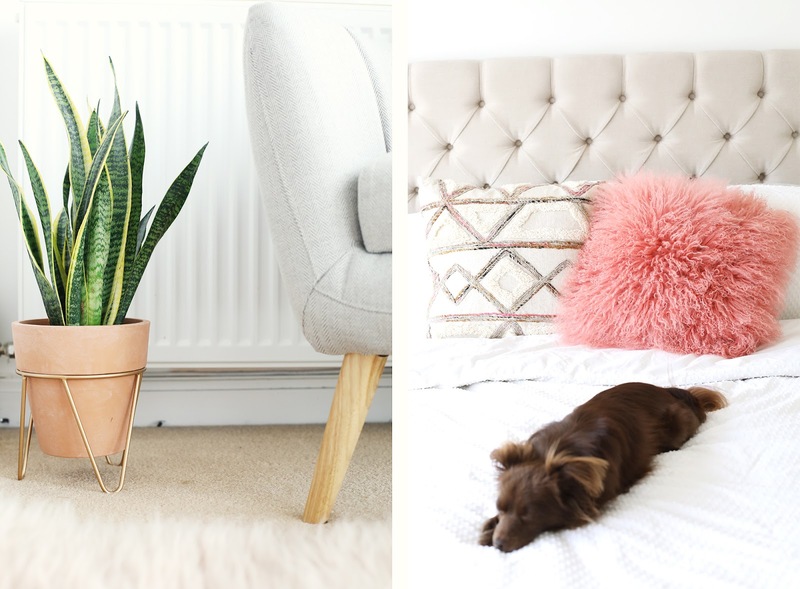 We also bought a tan coloured fur rug (£34.99) which slotted in perfectly to the side of it, and a tan and gold planter which sits perfectly to the side – all four make the perfect little nook in the corner of our bedroom and I couldn’t be more pleased with it. To go with the more natural colour palette we’ve introduced to the bedroom I also picked up this fringed cushion (£24.99), which almost has an aztec pattern to it, I love it and it fits in perfectly with all of the baskets and tan tones of the bedroom. 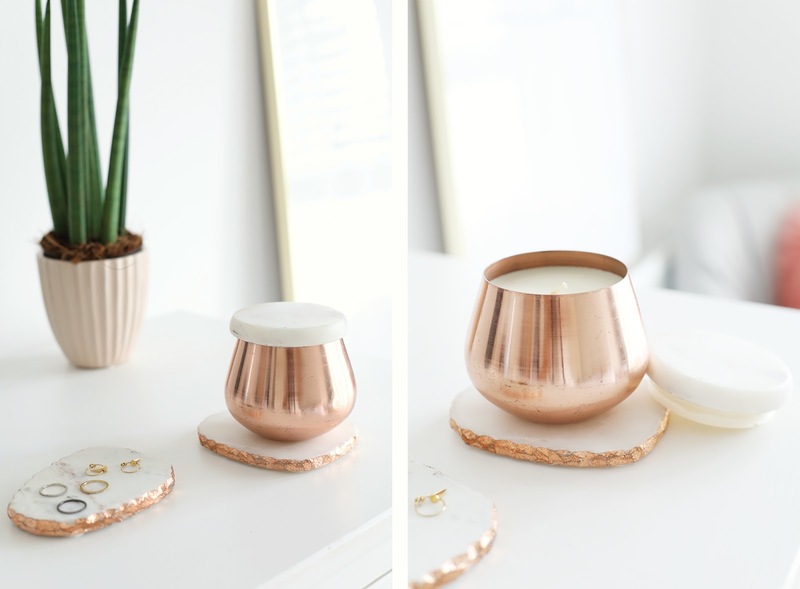 The final purchases were perfect for my bedside table – the copper candle with a real marble top that cost £7.99 and smells so citrusy and fresh, followed by an everyday basic that has a little bit more of a luxury feel to it – but without the matching price tag! 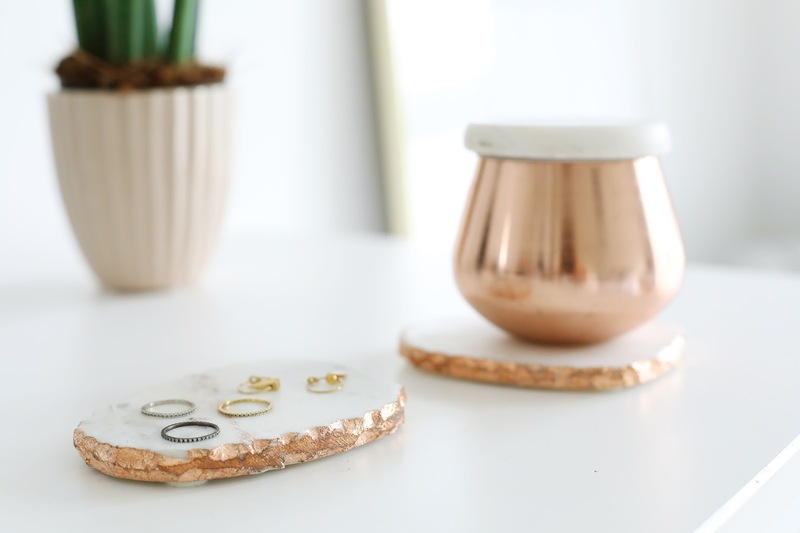 These marble coasters with the rose gold foil around the rim go perfectly with our green marble side tables, but also match the neutral tones of the room perfectly, and at £9.99 I couldn’t be more pleased! Don’t forget to check out the Come Shopping With Me vlog for all the details and to see what else they have in store! Keep an eye out for my next blog post where I’ll be showing you everything I bought for our living room and kitchen! Find your nearest Homesense store here! It all looks gorgeous! I took a trip to Homesense yesterday and I was overwhelmed by it all, definitely need to go again! Such a cute little nook. I love homesense! Love the way it looks – amazing! I'm seriously the BIGGEST fan of Homesense, I could shop there everyday ahah! I love how you decorate your house. I've been following you on Youtube and Instagram to get more scoop of your new house! 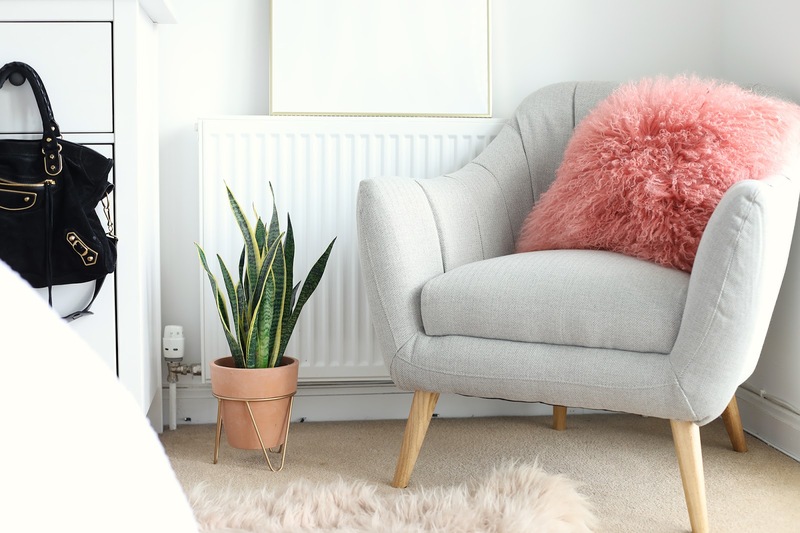 Loving all your interior content Suzie – please keep it coming! Everything looks gorgeous, this makes me so excited to decorate my new flat when I go back to uni! I'm hunting down those coasters…..
Omg those candles!!! I love the soft natural tones! I LOVE the chair! Need to get me to a Homesense I think! That pink cushion is gorgeous! Oh my goodness I can't tell you how much I love all these gorgeous home decor details. It looks GORGEOUS! Love that you're sharing more interior content and I adore your new home Instagram account! Girl you are the queen of interior! I WANT EVERYTHING! Gorgeous pieces. I love everything you picked! Your homesense vlog was so much fun to watch! I wish Homesense came to Australia! drooling over all this homeware! !